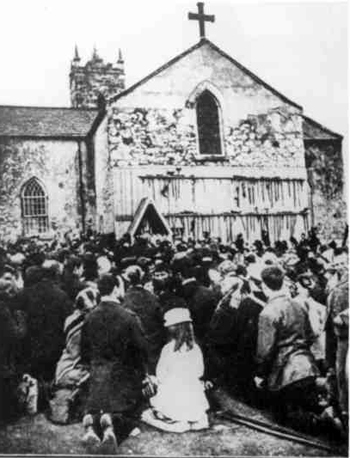 One rainy night on the 21st of August 1879, from around 7:15 to 9:30 in a small village of no more than a dozen homes, Our Lady made a unique, silent public appearance that has become known to the world as the apparition of Our Lady of Knock. The village of Knock (which means ‘hill’ in Irish) lies in the northwest quadrant of Ireland, about 28 miles east of Croagh-Patrick, and this prophetic mountain can be seen to the west on the road north from Claremorris to Knock. (1) The pilgrimages to the shrine in the little village have steadily grown since that day, and it presently receives 1.5 million visitors a year. 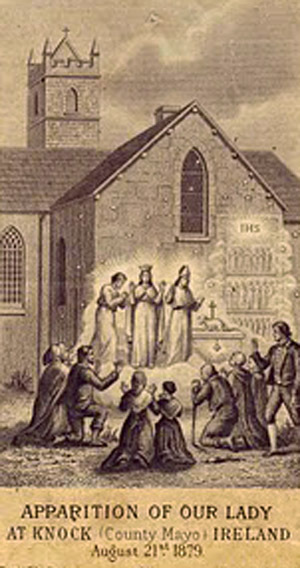 In 1932, Pius XI declared Our Lady of Knock to be “Queen of Heaven and of Ireland” at the closing of the Eucharistic Congress. (2) It is considered to be one of the prominent Marian Shrines of the world. I say Our Lady made a “public appearance” because, unlike other recent apparitions of Our Lady - La Salette, Lourdes, Fatima - where she appears and communicates to only one or a few seers (always youths and never members of the clergy), in this apparition she appeared to all present but remained silent. Everyone at or near the south gabled wall of the church dedicated to St. John the Baptist saw the apparition. The only member of the clergy in the village, the pastor Archdeacon Cavanagh, could also have seen the apparition if he had simply stepped outside. His housekeeper went to tell him about it, but apparently there was some miscommunication and, as a result, once again, the clergy did not receive the gift of seeing an apparition of Our Lady. Shortly after the apparition, an official commission of investigation was set by the Archbishop, and it recorded the testimony of 15 witnesses: men, women and children, ranging in ages from 5 to 75. At the inquiry, the commission found that, “the testimony of all, taken as a whole, was trustworthy and satisfactory.” (3). Many years later, in 1936, a second commission confirmed the verdict of the first. There were others who saw the apparition (my readings suggest somewhere between 25 and 29 people), whose reports were not officially recorded to avoid redundancy. I live at Knock; I remember the evening and night of the 21st August last. Mary Byrne called at my house about eight o’clock on that evening, and asked me to come and see the great sight at the chapel. I ran up with her to the place, and I saw outside the chapel, at the gable of the sacristy facing the south, three figures representing St. Joseph, St. John and the Blessed Virgin Mary; also an altar, and the likeness of a lamb on it, with a cross at the back of the lamb. I saw a most beautiful crown on the brow or head of the Blessed Virgin. Our Lady was in the centre of the group, a small height above the other two; St. Joseph to her right, and bent towards the Virgin; St. John, as we were led to call the third figure, was to the left of the Virgin, and in his left hand he held a book; his right hand was raised with the first and second fingers closed, and the forefinger and middle finger extended as if he were teaching. The night came on, and it was very wet and dark. There was a beautiful light shining around the figures or likenesses that we saw. I went within a foot of them; none of us spoke to them; we believed they were St. Joseph and St. John the Evangelist, because some years ago, statues of St. Joseph and the Evangelist were in the chapel at Knock. All the figures were in white or in a robe of silver-like whiteness; St. John wore a small mitre. Though it was raining, the place in which the figures appeared was quite dry. Everything within the sphere of the image remained completely dry including the grass and part of the church wall. Consequently, no one should think that the silence of the apparition is an oversight of Our Lady. With certainty, we can affirm that Our Lady willed that this apparition should remain completely silent and that this silence serves a purpose. What is that purpose? Fatima (1917) included 3 secrets: 2 were soon revealed, and the third was to be revealed in the event of Lucia’s death or by 1960. John XXIII refused to reveal the secret in 1960. Later in 2000, a bogus secret was revealed by Cardinals Bertone and Ratzinger on behalf of John Paul II, but it did not find great acceptance among the faithful. They still await the release of the authentic warning of Our Lady to the world. Now, since every recent apparition of Our Lady contained a secret, one is induced to ask whether or not there would be a secret at Knock. Perhaps it should even be expected. 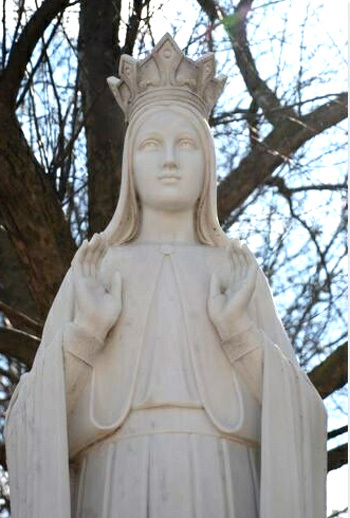 So, I ask, shouldn’t this deliberate silence willed by Our Lady at Knock be seen as some form of secret? A secret that harmonizes with the secrets of La Salette, Lourdes, and Fatima? Isn’t it reasonable to affirm this? Shouldn’t one ask if the silence acted as a sort of veil or shroud, concealing a profound message? I believe this is the deep-seated purpose of the silence and suggest to speculate upon what that secret would be using the evidence that we have at hand. One closing note: I do not agree with those who say that the silence itself is the message. The message of Our Lady of Knock is not to promote silence. Those who try to present this silence as the main message that Our Lady wished to convey are promoting a passivity that pressures the faithful to remain inactive and just pray in face of the grave crises in the Church and society we face today. To keep silent before the onslaughts of an evil world and a corrupt Hierarchy is to suppress the Catholic militant spirit. As will be shown in future articles, I believe that the message of Knock is the opposite of a lifestyle of “peace” where “all my cares and troubles cease,”(6) a phrase from the chorus of the popular Lady of Knock song that has effectively become the modern day theme song of Our Lady of Knock.